Lincolnshire schools have scored above the national average in the annual GCSE results tables. A total of 50.6% of pupils in Lincolnshire got 5 or more A-star to C grade GCSEs last year - almost 4% above the English average. Caistor Grammar ranked 14th in the country for its GCSE scores while the King's School in Grantham was 24th in the same list. The county was 33rd on the national table out of 148 local authorities. 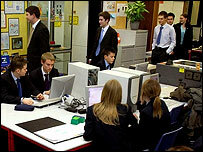 At the other end of the scale, St Clement's College in Skegness ranked 3rd worst in its GCSE results. Castle Hills Community Arts College (13th worst) in Gainsborough and St Bede's Catholic Science College (14th worst) in Boston also scored poorly in the national GCSE table. Ros Gulson, head of Walton Girls High School in Grantham, which ranked mid-table in the county's GCSE table and increased its results over last year by 20%, said: "We have worked hard to achieve these results." The Lafford School in Billinghay, Joseph Ruston in Lincoln and the Walton Girls High all saw a rise of more than 20% in the number of pupils gaining five or more GCSEs at A* to C grade.